What an enjoyable weekend. 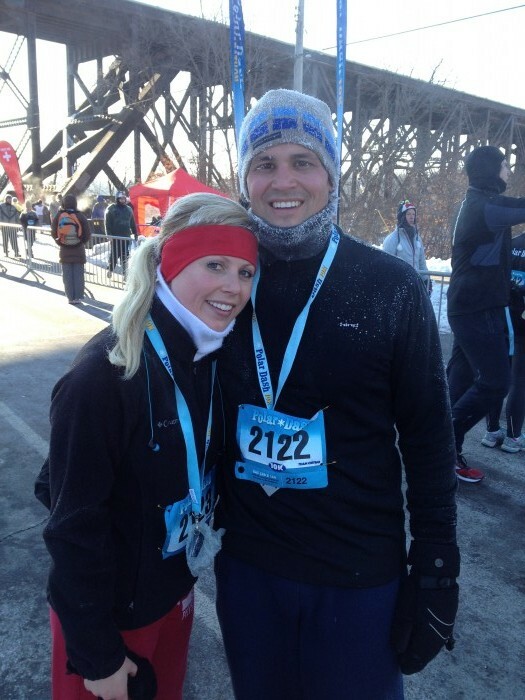 The weather was incredible, I was able to relax, hang out with family, friends, and run a 10k with Dana! I can’t believe I neglected to take one photo of the actual race site at Minnehaha Park because it is a very beautiful area, but I didn’t. We raced up the streets parallel to the river, crossed the river, came back down the other side, and then crossed the river again. I am always happy when the route is an actual large loop versus multiple laps. That is 25 lbs of pure salted nut roll heaven right there. They were cutting up sample bars and I just had to sample one myself and OMG. This was the best Salted Nut Roll I have ever eaten, and I’ve eaten my fair share. It was so soft and there was so much NOUGAT :smile:. I savored every last bite of that magical bar. Moving on to race day. Dana and I gave ourselves plenty of time to get over to the race site but unfortunately the shuttle buses to get runners from the parking area to the race site were not super efficient and by the time we got to the race site, checked our bags (this took a while too) and got into the bathroom lines, we had about 15 minutes until start time. The bathroom lines were reeeeaaaallly long. I started to get my little anxiety spurts that I get just prior to races and was nervous that we wouldn’t be at the start line when the race began. I knew it didn’t really matter if I was or wasn’t there when it actually began because we had time chips in our race bibs, but I just like to be where I’m supposed to be at any given time. They made the five-minute until go time announcement and we were still in line, with about eight people still in front of us. Then the two-minute announcement was made and we were still four people back. The National Anthem was sung and there was 26 seconds of silence to honor Boston and everyone involved in the tragedy. The race began and we were still in line. We finally got our turn for the glamorous porto-potty’s and then made a mad dash to the starting line while “washing” our hands with antibacterial goop. By the time we got to the start, there were still TONS of people who hadn’t yet crossed the start line. So basically all of that anxiety and rushing to get to the start line really wasn’t necessary. That was how our race began. The course was really great and spectators were lined all along the streets almost the entire way. At about one mile in I was struck with side aches on both sides. I used the breathe in through your nose, out through your mouth technique to try to get rid of those bad boys but I wasn’t having much luck. It wasn’t until about mile 5 that they started to go away. Needless to say this wasn’t my best or most enjoyable run, however I am always proud to say that I finished it and I didn’t stop to walk even once. I finished in 1:01:26 which was about one minute slower than my January 1st 10K race. I was a little disappointed because I had wanted to break the one hour mark, but I didn’t get too hung up on it. I just ran 6.2 miles and I was going to be proud of it! It was SO nice to run in warm weather and not have to be bundled up from head to toe. The sun felt heavenly. By the time we got home I was exhausted and hungry. I made myself some food and then joined Moose out on the deck to get some rays and relax. Goodness he’s a big boy. I gave my camera a rest for the remainder of the weekend but will tell you I had such an incredible weekend. The highlight was spending time with family and friends and enjoying the sunny warm weather. Well, hello hello! It’s Monday and it’s gloomy BUT I am going to stay positive for all of us and say it is going to be a GREAT day. I would love if you did! Anyway, I do have some catching up to do from Saturday! It was a super fun day! The rain held off and Dana, Moose, and I were able to hit the pavement for our Saturday run. We mapped out five miles around the neighborhood and they were five hilly miles. We live in a very hilly neighborhood which is both a blessing and a curse at the same time. It’s great for training but sometimes you just want an easy flat run, and we can’t get that around here. Moose’s paws held up just fine this time around. Last week they got a little scraped up and were bleeding. He is toughening up quickly again now that spring is here. Yay! In the afternoon I headed out to Minneapolis to meet up with a handful of other Minnesota bloggers for our first ever MN blogger meet up. Katie from Running4Cupcakes and Becky from Olives’n’Wine (remember that awesome cupcake guest post she wrote for me in March?!) organized this get together and I am SO happy they did. We met at Sebastian Joe’s (the one off of Franklin) which I must say has some spectacular sorbet. As you know I adore ice cream but I had plans to go out to dinner that evening so I didn’t want to risk an upset stomach, which is why I stuck with the dairy-free sorbet. Any other day, you know I would choose ice cream, let’s be real. I went with the Strawberry-Basil Sorbet and it did not fail. It was incredible; so fresh, with huge hunks of strawberries, and a hint of basil. It was very refreshing. Your mouth watered didn’t it? I surprisingly wasn’t too nervous to meet up with these girls. In the blog world you kind of feel like you know each other from reading each other’s blogs and commenting back and forth. We all said it was kind of weird at first only because we already “knew” the little tidbits about each other that most people would use to start-up conversation, so our conversations hedged a little further right away. We chatted about our lives, blogging, social media, etc. We all got along very well and the hour and a half we were there seriously flew by so fast. The conversation was great! We are planning another meet up in the next month or two so if there are any other MN bloggers out there who are interested in meeting up, throw an email my way! We are hoping to make the next meet-up a bit more active—like a walk around the lakes or something. Such a great group of ladies! I’m so happy I had the chance to meet you all! Thanks again Katie and Becky for organizing this, you rockstars. In the evening we had a dinner date with my parents and Dana’s parents. We met at Axel’s Bonfire which is a cozy and warm restaurant that specializes in wood fire cooking. I ordered the Barbacoa Tacos which had seasoned beef with pineapple relish and chipotle cream. I asked if they could prepare them in lettuce cups instead of flour tortillas and they said of course. Never hesitate to ask for modifications to your meal. Remember you are paying for it, you may as well get it how you want it and 9 times out of 10 they will be able to make the modification for you. Check out these beauts! I had to pick off some of the peppers on there because they were making my mouth feel like fire, but this dish was very tasty. It came with beans and rice so I ended up scooping the beans onto my taco as well as the pico de gallo on top of the rice. Besides the food being great, the company was even better. I adore my families and always enjoy spending time with them! Talk about a fun day, right? Sunday was our usual gig; breakfast, paper, coupons, hanging out with the pup, grocery shopping, lunch. In the afternoon we headed over to my mom and dad’s house because my brother Scotty and his girlfriend Nicole were in town! We spent the afternoon and evening hanging out, eating a totally nummy dinner (rotisserie pork loin, brussels sprouts, broccoli, salad, and potatoes), and catching up on life. I was so happy to be with my family again! Ahhh I just love them so much. We made it home just in time before the sun went down to take Moose for a little stroll around the neighborhood. We watched the Academy of Country Music Awards when we got home and then called it a night. This weekend FLEW by. What the heck?! Haha, it always does though. Okey dokey, I am off to take on the day. Make it a great one and be thankful for the day. Catch up with you soon! It’s Friday! Oh yea, baby! Before we get too excited about this glorious day of the week, let’s take a quick look at Thursday, shall we? I had a really great day. I actually kept thinking yesterday was Friday. I was super messed up on my days. I had the day off and I started it off by meeting up my high school friend Ted, for coffee at Caribou. Why on earth have we not gotten together sooner, I don’t know. All I can say is it was so nice to catch up with him. He is such a positive person and I love having positive people in my life! There is no room for negativity in my life. In the afternoon Dana and I took the pup out for a 3-mile loop around our neighborhood. The weather was absolutely perfect for an outdoor run; about 50°F and sunny. I was even able to wear my capris outside for the first time this year! Moose is still working on his stamina. He was pretty wiped immediately after the run. I seem to have worked whatever food or medication allergy I had out of my system, because I have been feeling back to normal. The only thing I can think of that may have triggered it is the abundant amount of strawberries I had eaten those few days, but I’ve never had a problem with them in the past! Again, another reason I would like to have an intolerance test done. For lunch I threw together a ginormous veggie-packed salad. I loved the volume of this salad. In the mix was mixed spring greens, broccoli, carrots, red pepper, celery, a spritz of olive oil, hummus, and sunflower seeds. Wowza it was GOOD. There were a few snacks eaten throughout the day to tide me over between meals, all of which went unphotographed. We made a purchase yesterday to add to our “at-home gym”….. I wasn’t messing around when I said I am going to conquer at least one unassisted chin-up before May. We put this up in the doorway on our main floor so that I will be more likely to use it often. Like I said previously, I still have a LOOONNNG way to go, but I’ll get there! Mmm mmm, dinner was tasty last night. Stir-fry has got to be one of the easiest meals to make and it always comes out well. Last night I pulled out the wok and sautéed up onion, garlic, red bell pepper, broccoli, sugar snap peas and carrots in sesame oil. Once the veggies had cooked through, I added about 1/3 of a cup of bone broth along with 5-6 splashes of coconut aminos (more on that in a sec). I also added a few sprinkles of garlic powder, onion powder, ginger, and salt. I then let the liquids cook out, added some leftover cooked chicken, allowed that to heat through and VOILA! I served the stir-fry over cooked quinoa (I let the quinoa soak for 24 hours before cooking to help with digestibility) and had myself a deliciously gluten-free and soy-free dinner! So, about those coconut aminos I mentioned…. It can be used as a substitute for soy sauce! The flavor is a bit more bland compared to regular soy sauce, and less salty, but it did add a really nice flavor to this stir-fry dish. For those of you out there who are looking for an alternative to soy-sauce, I would definitely recommend giving this a shot. I will be 100% honest with you though, I still prefer soy sauce. But it’s still pretty neat, right? What will they think of next?! These are SO good! And the ingredients are so simple: Organic corn meal, organic evaporated cane juice, organic peanut butter, organic soy oil, sea salt, tocopherols (natural vitamin E), organic tapioca starch. I don’t plan on eating these daily, but they are going to be nice to have around if I want a little treat. Alright, now that we caught up on Thursday we can officially celebrate Friday. I hope you all have a FANTASTIC day! Keep on smilin’ my friends. Question of the day: Have you ever used liquid aminos before? What are your thoughts?